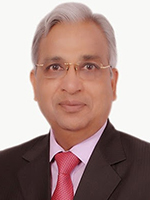 Ved Jain, the Firm’s founder and mentor, is a renowned Expert on taxation matters. He has supported various clients from assessments to High Courts. Having an experience of more than 35 years in the field of taxation, he has been a regular advisor to the Govt of India on provisions of Direct Taxes including Transfer Pricing and Corporate Law. An avid writer, he has been regularly contributing articles to various reputed journals and has written various books on critical matters of taxation.